It’s flu shot day. I have a feeling that today will go smoothly. But two years ago, it didn’t. And I notice a sense of dread creep up on me like a zombie in a haunted mansion. A few years back, E asked about whether shots would be involved with his upcoming doctor’s appointment well in advance. And when we got to the doctor’s parking lot, he started bawling and refused to get out of the car. I took deep breathes and watched the clock. An astonishing half hour later (seriously, I timed it), he finally emerged from the car to go into his appointment. After his shot that day, he seemed traumatized and it took the whole evening to recover. That next week, I took him with me when I got my flu shot at the local drug store. I let him watch and I asked a number of questions of the pharmacist who administered it. I quizzed her about all of the safety factors involved while E was listening. The next year, we talked about why flu shots are important and what can happen as a result of not getting the shot. And he, though scared, went into the appointment. This year was similar but E set out to prove how brave he truly was. Though I could tell he was nervous, he didn’t resist any step of the way. And I am proud he was able to face his fear. Understanding fear and how it impacts our children can help us be more responsive and empathetic parents. We can learn how to raise kids who are courageous. Fears begin in infancy when babies under a year old cry when they encounter strange people or things that they do not recognize. The emotional response serves as a key biological function to help babies and children survive. A threat is detected in something or someone unknown and a baby seeks your help in those moments. Toddlers may fear loud noises, separation from parents, and large objects. 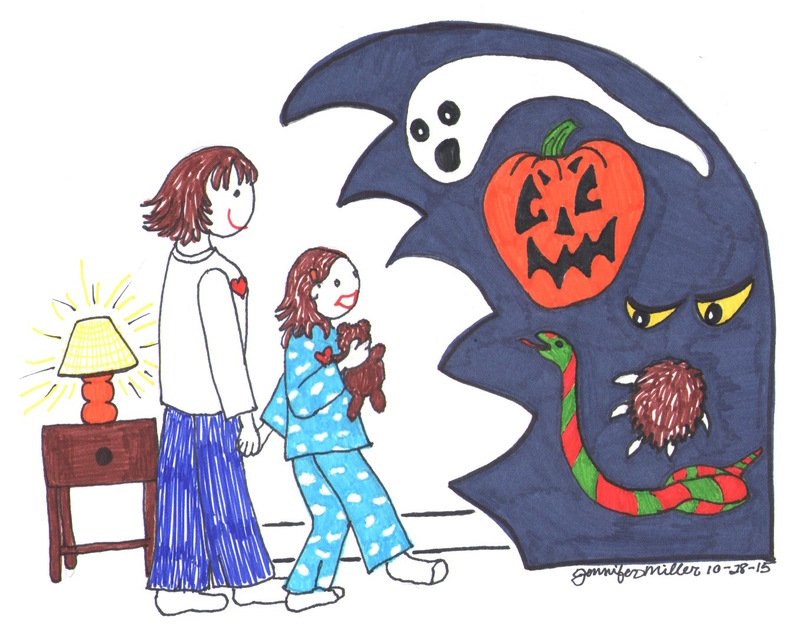 Preschoolers may fear storms, the dark, monsters, supernatural or magical forces, or noises. And school-age children begin to fear issues we fear as adults such as failure, death, peer rejection, and natural disasters. Fear is experienced differently by every person. There is no predicting what particular fears your child will have or develop. The key is to pay attention to fears and work to understand them. Modeling is a critical teacher so first, take note of your own reactions and anxiety. We can unwittingly contribute to and escalate any fear if our child reacts and we respond with anxiety. So becoming self-aware and practicing our own self-management over anxiety in those moments is fundamental to helping our child. I notice that I can hold greater patience in those times of struggle when I put my “teacher hat” on. All of a sudden, instead of being an annoyed parent, I become an intelligent and empathetic adult whose role is guidance, modeling, facilitation, and support. We can learn a lot from a study done at Virginia Tech with expert scholars who have had a 60-75% success rate in tackling severe child phobias. I have summarized their steps here for addressing a child’s fears adding in my own perspectives and context for parents. Unpack the fear. Talk through the emotions with a child in an open time when you don’t have other pressures. List out all aspects of what they are afraid of. If it’s the dark, what parts of the dark don’t they like? What do they see? What do they imagine? What’s the worst thing that could happen to them in the dark? Find out all of the aspects of what’s worrying them and be sure to discuss their worst case scenarios. Begin with the least scary on the list of fears and become informed together. Provide education and safety information about that topic and the more interactive, the better. For example, what causes the dark? Are there more safety risks in the dark? What are they? How can you address them? Do you need night lights in the bedrooms and in the hallways? If there are issues you can research in children’s books together, that is a great process for exploring a high anxiety topic. Or else go and pick out night lights to serve as a safety measure. Involve your child in addressing the issue. Take small steps toward facing their fear. Ask your child first with each step forward. And make it a fun. The experts at Virginia Tech made it a game with the kids with whom they worked. They did not push but stopped if children were getting upset. They “proceeded slowly through the fear hierarchy and did not move on without the children’s consent.” 1 For example, you might throw dice and take the number of steps rolled toward the chair. Or you could advance stuffed friends along with your son to see who might be brave enough to step forward. Continue with small steps as your child consents. With each small step, your child will learn to trust working with you on his fear (because you are not pushing but allowing him to set the pace). You will offer practice in facing his fear through these small steps, inching closer to the darkness until he is ready to turn out the lights altogether. Return to safety. If your child struggles along the way, you can always return to safety. Turn on the lights. Talk more about safety issues such as checking to see if all of the doors are locked so no strangers could possibly get in your home. Help your child feel comfortable at each stage of the process. First and foremost, we want our children to survive and thrive in what sometimes may seem like a cruel world. It is a common belief that we must toughen up our kids for what they must face in life. Sometimes that belief translates into pushing kids beyond their coping capacity. We may force them into petting a dog they are terrified of approaching because it is our belief that they have to face their problem. Indeed it does make children strong for them to face their fears but the only way they can truly conquer them is on their own terms. No amount of pushing, forcing, punishing or yelling on our part is going to help. In fact, it will do the opposite. Children may squash their fears so that they are not pushed by a parent anymore or don’t have to disappoint them again. But as a result, they might not only increase their fear but also become shameful, angry, and hurt in the process. That shame will contribute to an inability to take healthy risks which directly impacts their ability to achieve success. “Toughening up” in its many forms, whether it involves ignoring a child’s upset feelings or pushing them into his fears, places a child in crisis. And that feeling of crisis results in a fight or flight mental state. The child may become more defensive and trust you less. This method works in opposition to its intended goal. One of the greatest challenges we face as parents are watching our children suffer whether it’s from fear or pain. We want to fix it – and quick. But because fears are about how an individual perceives the unknown, it is utterly personal. The only way for a child or any person to move through a fear and come out with confidence and bravery is for that individual to control how he faces the fear. You can play a critical role by facilitating that process and in turn, preparing a child for life’s challenges. Happy Halloween! May you conquer your own fears and have patience as your child bravely works to conquer his own. Originally published on October 26, 2015.